Can you believe the holidays are just around the corner? I can't! I've been trying to get a jump start on Christmas projects so I'm not rushing around at the last minute. I actually completed my baby girl's Christmas stocking about a month ago (I know, I'm actually ahead of the game--yay me!) and I'm almost done knitting Christmas stocking caps for all three members of my little family (pattern coming soon!). So, I decided to make my daughter a Christmas onesie. I just adore how this turned out! I think this embellishment would be cute for older girls, too, and not just babies. Start by marking the center of the onesie with a few pins. Cut 15 4-inch lengths of the green ribbon. The finished tree will end up being about 4-5" tall, so determine roughly where you want to place the bottom of the tree. On a 9 month onesie, I went a little above the waistline. Fold one of the ribbon sections as shown in the picture and pin it at your center mark wherever you want your bottom row. Add three more ribbons on each side of the first one, for a total of seven in the bottom row. 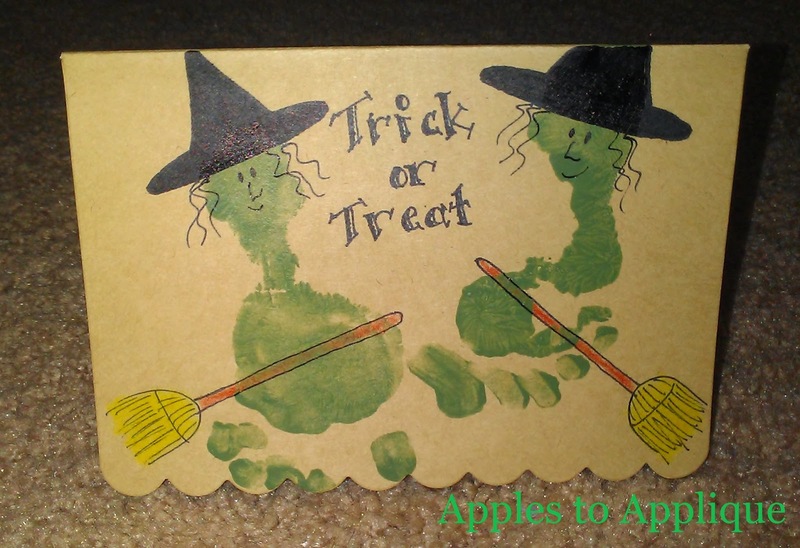 Curve them around just a bit so they aren't in a perfectly straight line. Sew the ribbons to the shirt using one continuous line of stitching to attach all seven ribbons. Sew 1/4"-1/2" from the top edges of the ribbon; it doesn't have to be perfect or exact. To make the second row, pin five ribbons on just as you did for the bottom row, overlapping the bottom row about 1/2". Sew the second row on just as you did the first. 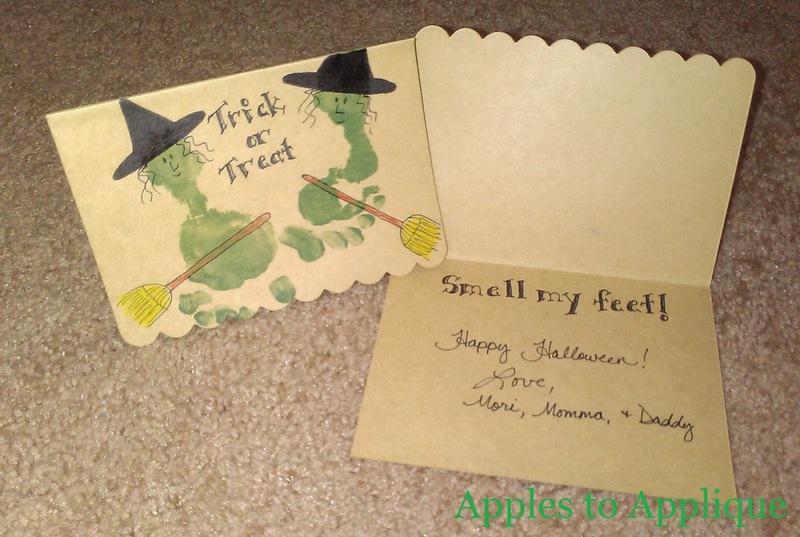 Pin the remaining three ribbon sections to create the top row. Overlap the ends of all three ribbons so that your tree has a narrow top. Sew this row on as you did the previous two. Drape some of the red rick rack across the bottom row to see how long the piece needs to be cut. Pin the rick rack to the shirt and sew it on. I recommend putting it on at an angle; again, it doesn't have to be perfect. Add rick rack to the second row, angling it the opposite way. Add rick rack to the top row. Following the same steps, add gold rick rack to each of the rows. I liked to crisscross mine with the red, but do yours however you like. Finish off the shirt by sewing a star button at the top of the tree. If you are making this for a baby, make sure the button is extra secure so it cannot be pulled off by curious little hands. I hope you enjoy making this easy Christmas shirt for the special little (or big) girl in your life! This project is the easiest yet in my series on DIY baby clothes! This one starts with ready-made onesies, so it is a little different than the other projects in the series, which so far have started with old adult clothes. It is so fast and easy to decorate onesies; I did all four of these during one nap time. My little girl has gorgeous blue eyes, which really pop with blue shirts. Additionally, I'm not a huge fan of pink and frilly, and I am a firm believer that baby clothes should be comfortable (I don't know about you, but I wouldn't want to take a nap or lay on a blanket with a ruffly skirt bunched up underneath me), so my little girl owns several "boy" onesies. But of course, when I put her in blue, everyone thinks she is a boy. This doesn't bother me too much, (and certainly doesn't bother my psychologist husband who loves to talk about societal expectations in regards to gender roles) but I decided to "pretty up" some of her onesies in a way that would look more feminine, even if they are blue, and still be comfortable. I started with this four-pack of plain onesies. First, I started with the navy onesie, putting a couple of pins in place to mark center front. I had to put a couple of diagonal folds in the bottom (where you can see the diagonal pins) to get it to lay right. Then I basted the lace together down the middle and along the diagonal lines. To do this, I laid it on top of a piece of stabilizer as I sewed it. If you don't have stabilizer, you can use tissue paper. This just gives the lace a solid foundation to sew on. Very carefully, I cut away the stabilizer as close to my stitches as I could get. I pinned the placket onto the front of the onesie. I sewed down the center of the placket as well as around the edges. Finally, I finished by adding three buttons. As always when adding buttons to baby clothes, I made sure they were very secure by using more stitches than I usually would when attaching them. I think this one looks so sweet, and has a slight vintage feel to it with the crochet lace and buttons. Next, I did the light blue onesie. This one was the fastest and easiest of all of them. I found this darling flower trim with just the right colors. 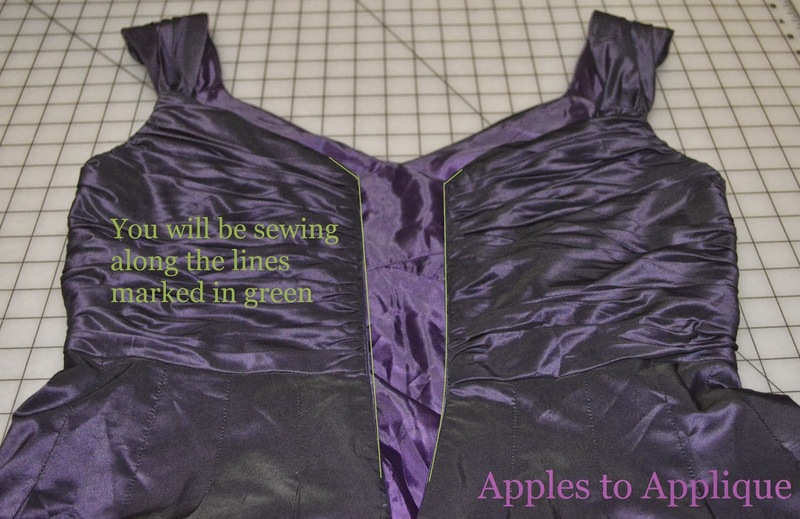 If using just a single row of trim like this on a onesie neckline, you will need about 1/4 yard. 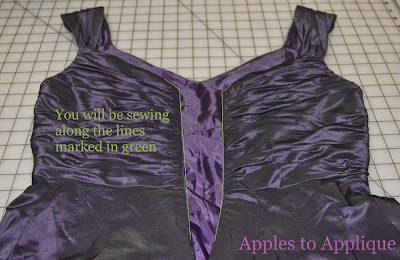 Make sure when adding trim to the neckline of a onesie to start underneath the shoulder flaps. See in the picture above how I've lifted the back shoulder flap and have laid the trim underneath where the flap normally goes? This gives a nice finished look to the neckline. I just sewed this trim on without even pinning it first, lining up the edge of the flower petals with the edge of the neckline. It took about 5 minutes and looks precious! This one is colorful and fun! On to the gray onesie, to which I decided to add some delicate white lace. I liked this trim, but wanted a little more pizzazz, so I went with two rows of it, slightly overlapped. I sewed on the first row, lining up the edge of the lace about 1/4" below the neckline. Again, I made sure to start the trim underneath the shoulder flaps. Then I sewed on the second row, overlapping the first row and lining up the edge of the lace with the neckline seam. I love the white lace with the gray; simple and sweet. The final onesie took just a little bit more time, because I wanted to weave a ribbon through it, which meant I had to put in eyelets, which I had never done before. Even still, it didn't take long, and the end result is pretty cute. I marked the center front of the shirt, and then evenly spaced two more eyelet placements on each side. I made a small mark at each placement point and removed the pins. Next, I installed an eyelet at each point following the manufacturer's instructions. A note, though, on their instructions: I wish I had not used the plier tool to actually punch the hole in the fabric. While I'm sure this is fine for denim or "tougher" fabrics, it was too hard on the soft knit fabric of the onesie. I ended up with two small holes on some of them, one where the punch went through, and one from the metal edge of the punch. It took me a little bit to figure out what was happening, and then I realized I just need to snip a tiny hole in the fabric myself and then install the eyelet, eliminating the step of punching the fabric. I wove two ribbons through the holes, having the ends of both ribbons coming through the same eyelet in the center. I turned back the shoulder flaps and sewed the ends of the ribbon to the onesie to secure them. I finished by tying a bow in the center and sealing the ribbon ends. And, because this is for a baby, I recommend hand stitching the bow closed so it can't be untied. I'm loving this combination of black and white with this gorgeous green! There you have it, four new onesies in one nap time! Not bad for a couple hours' work. My little girl's fall/winter wardrobe is really shaping up nicely. I'm taking a brief break from making baby clothes to work on our costumes for the Renaissance Festival. I found a gorgeous dress at a thrift store to use as the starting place for my costume, but it was a couple sizes too small. Since I have always wanted to try my hand at converting a zippered dress into a corset back, I bought the dress and decided to give it a try. It turned out great! However, I must put in a disclaimer here: this method is perfect for costumes or less formal occasions, but I wouldn't recommend it for something like a wedding gown. To do that properly, you need fabric loops on the edges. As I didn't have matching fabric (and didn't want to take the time to make fabric loops even if I did), I went with buttonholes. It worked splendidly! Also, don't try to change the dress more than 2 sizes. Sorry ladies, you just cannot make a size 4 into a size 12. :) The dress you start with has to fit you at the hips (because you won't be adding any extra width there), so a dress with a wider skirt works best. You can also start with a dress that fits you, you'll just do one thing slightly different, as I will point out along the way. To do this, all you need is an old dress, and some double-fold seam binding to use as the tie. I went with some about 1/2" wide, but use whatever width sounds best to you. It's hard to tell, but there is an invisible zipper there. You can do this on a dress with an invisible zipper or a regular zipper. Open up the zipper and rip it completely out of the dress. Be careful not to snag the dress in the process. It can take a little time, but it's mindless work, so turn on the TV and relax while you work. Next, you will sew the two back sections closed. In this next picture you can see I've marked the area where you will be sewing (on the inside of the dress, of course). (Please note the above picture is just a rough idea to show you the process, and the indicated sewing line is probably not accurate. 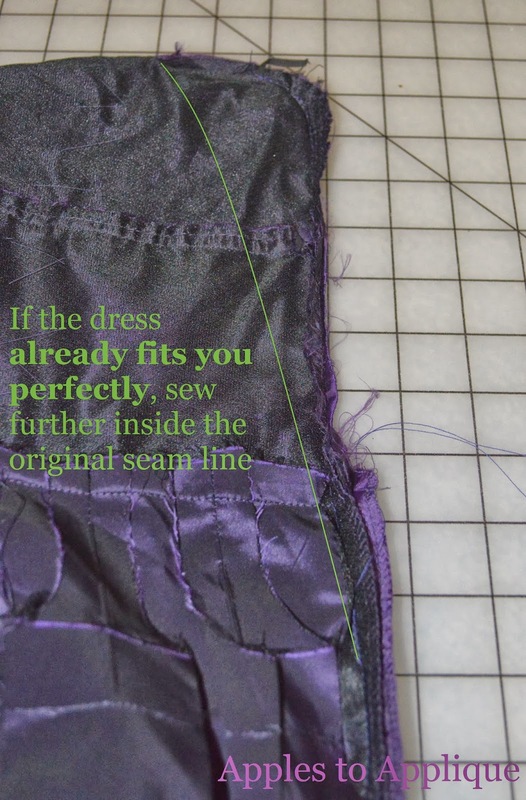 Sewing about 1 1/2" inside the original seam line at the top will give you a nice starting place for your corset). Flip the dress right side out again and give the new seams a good press. Mark some buttonholes along the two opening edges at even intervals. Make them for the width of the seam binding you are using to lace it up. Because my seam binding was 1/2" wide, I made the buttonholes to fit 1/2" buttons. Play with it until you get a spacing you like. I ended up leaving gaps measuring about 1 1/2" between each buttonhole, because I wanted the lace to be slightly more spread out. You can make yours closer together or farther apart. Sew a buttonhole at each mark on both sides of the dress opening. The dress itself is done! To make the lace, keep reading. If needed, join the ends of two packages of seam binding to make the lace long enough. These things need to be much longer than you think, and the more buttonholes you put in, the longer lace you will need. Trim off the excess at the corner. Fold the seam binding back together, and you have a neat diagonal seam. (For a little more detail on this process, check out the end part of this post). Keeping seam binding closed, sew along entire length of open edge. To lace the back of your corset dress, start at the top and lace it like a shoe, crisscrossing the laces and always bringing the lace from the inside of the dress out at each buttonhole. You're done! That wasn't so bad now, was it? Enjoy your new corset back dress!